The Myerchin system puts both rigging knife and rigging spike in the same belt sheath of ballistic nylon. The multi-position sheath includes secure Velcro closures and options for mounting in any position -- even upside-down. The combination works as well for divers as for clipper ship crewmen. The 8-1/4-inch-long Myerchin A200P knife weighs only 7.5 ounces but wields a strong drop point blade of 440C high carbon stainless steel, ground with a serrated edge Myerchin developed especially for cutting rope. The quick-cutting serrations extend over three quarters of the knife's cutting edge, leaving only the tip section for plain-edged work. For undoing tight knots on lines you don't want to cut, the 6-1/2-inch stainless steel spike will come in handy. This 2.5-ounce rigging spike fits in a side pocket of the knife sheath and can also be used to stitch repairs in heavy sail canvas. 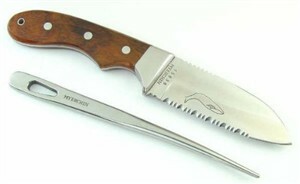 People who work regularly with rope or cargo straps, whether on land or on the water, will find much practical use for this professional rigging knife. Collectors might also find the A200P of interest, since to many, it's an unusual design. Each A200P knife is stamped with a unique serial number so you'll be sure you have the real thing. Built with a full tang handle and slab grips of tropical rosewood, the A200P carries a lifetime warranty.